A massive thank you to Wicklow Bay for hosting such a wonderful nationals! Unfortunately the weather was not on our side with torrential rain forcing the tournament to be postponed to the 10th and 11th of September, due to the threat of stormy weather the decision was made to turn the weekend tournament into a one-day tournament. However, the evening back was beautiful, and a stunning end to the 2016 season! There was great craic to be had and despite some slippery matches and a few tumbles, every team we sent out were fabulous and tried their best! A Grade: Paul O’Leary, Sam Hanlan and Debbie Harris. B Grade: – Richard Donnelly, Cillian Boland and Tom O’Malley. – Izzy Alken, Paul Boland and Amy Buckley. C Grade: Theo Boland, Cian Boland, Rosie McKeown, Lauren O’Malley, Naomi Crowley and Brendan Liddy. D Grade: Lucy Palmer, Siobhán O’Keeffe, Jonathan Paul Carrol. All of our teams played out of their skin and we are so proud of how far some of them have come in just the space of a season in terms of their skill! To see our results from the tournament head over to the ‘Tournament Info’ tab! Until next year guys and we hope to see faces both old and new around the club, at tournaments, and a big thank you to everyone who made this season so enjoyable and of course, we thank our horses who have carried us so far and worked so hard with us this season and for being our partners. Our club had a successful run at the weekend with Carrickmines coming first in the A/B grade with Paul O’Leary, Lauren O’Malley, Debbie Harris, Cillian Boland, Richard Donnelly and Cian Boland. Lauren O’Malley and Quest took the prize for best horse and rider combo. In C grade, Carrickmines Navy came second of Gokmen Altinkulp, Rosie McKeown, Vicky MacArthur, Paul Boland, Maggie Condren, and James Cook. In D Grade, Carrickmines took first with Lucy Palmer, Eleanor Flegg and Hannah Kileff with Eleanor Flegg and Kestrel riding away with best horse and rider combo. A massive thank you to all who helped, played, catered, and made the weekend so successful and enjoyable. See you all at nationals! As mentioned in our previous Facebook posts, we could like to congratulate those who made it to the Irish team, and those from our club who were selected to play, Paul Boland, Richard Donnelly, Tom O’Malley and Brendan Liddy! Carrickmines is incredibly proud to have club members representing on the Irish senior, and under 16 teams, with Dara Mangan on the seniors, and Theo and Cian Boland, Lauren O’Malley and Isabelle Alken on the U16s. In the other grades, carrickmines took 3rd place in E grade with Siobhán O’Keeffe and Lucy Palmer. In D grade carrickmines again came third with Vicky Maarthur, Eleanor Flegg and Rosie McKeown. A big congratulations to our B grade team of Tom O’Malley, Richard Donnelly and Sam Speedy who took second place. Lauren O’Malley and Quest took the prize for best horse and rider combo in C grade. In D grade Theo Boland, Eleanor Flegg and Siobhán O’Keeffe took second place with Theo Boland and Bourbon riding off with best horse and rider combo. In B Grade we took first place with Richard Donnelly, Paul Boland and Cillian Boland, we also took fourth place with Tom O’Malley, Sam Speedy and Cian Boland. In C Grade best horse was awarded to Rosie McKeown and CC. First place in D grade was awarded to Vicky McArthur, Siobhán O’Keefe and their super sub Anna von Schintling Horny. 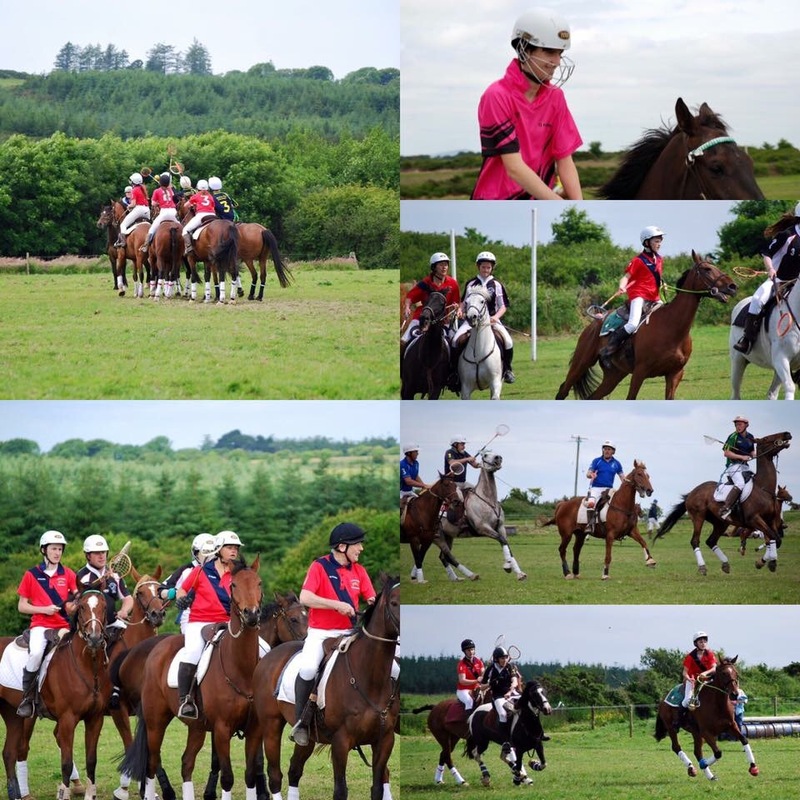 Carrickmines Polocrosse Club is based in South Dublin. It is made up of children, teenagers and adults who all share the passion and love for Polocrosse.